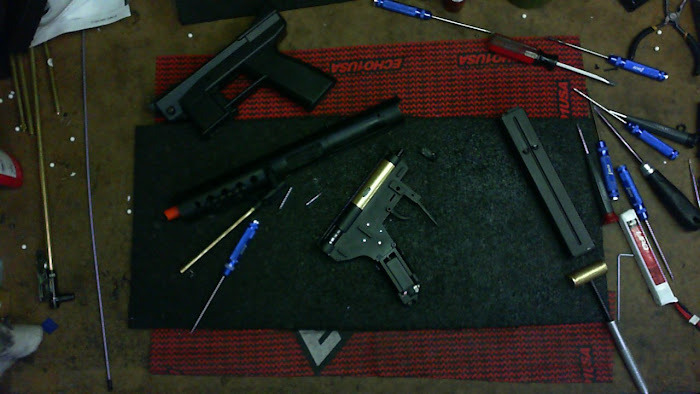 Pyramyd Airsoft Blog: "I Still Tote (Echo1) GATs Strapped With Infrared Beams," rapped the great Biggie Smalls. "I Still Tote (Echo1) GATs Strapped With Infrared Beams," rapped the great Biggie Smalls. I got to hang out with the Echo1 GAT AEG again recently and I thought I'd share a few things about it here on the Pyramyd Airsoft Blog. I'm certainly intrigued by this popular, yet elusive Airsoft handgun. Yes. I said handgun (and Airsoft, too!). In case you missed it the first time I reported on the GAT, check out my Shot Show 2011 update here. 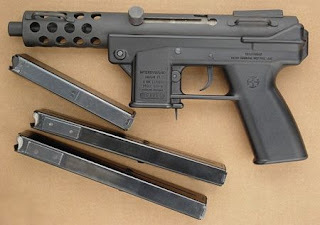 The real steel version of the Echo1 GAT AEG is the TEC-DC9, more notoriously referred to as simply the TEC-9 (It was one of the few firearms specifically banned by name in the Federal Assault Weapons Ban. The TEC-9 was produced by Swedish firearms manufacturer, Interdynamic (who would later become Intratec), and is classifed by our friends the U.S. Bureau of Alcohol, Tobacco, Firearms and Explosives (BATFE) as a semi-automatic handgun or pistol. It is NOT a fully automatic submachine gun, like I had initially thought. Oh, what's that? You already knew it was a technically a handgun but you didn't tell me because you were enjoying your sense of superiority in the knowledge department? You smug turd. Help a brother out next time, would you. I feel like my whole world has turned upside down. Apparently, thugs and other delinquents have modified their TEC-9s to fire in full-auto mode, but this is highly illegal, so I certainly wouldn't condone anyone do that. Anyway, Intratec was run by a dude named, George Kellgren, who may or may not be Swedish and would eventually leave Intratec and start a new firearms manufacturing company whom some of you may be familiar with: Kel-Tec CNC Industries, Inc. It seems that name is not just a random string of hyphenated alphabetic characters after all, is it? Oh, you already knew that, too? Well, darnit! Just sit tight then. I've got a BUNCH of things to share with you after the jump, some of which I KNOW that you don't already know. So check it! So about you not knowing something...Did you know about any of the following facts about the Echo1 GAT AEG gearbox internals? The Echo1 GAT uses a standard AEG piston and gears. There will be some new parts mixed in there as well. The GAT uses what's called the "Version E10" gearbox. "E" for Echo. The E10 Gearbox featured in the Echo1 GAT will be metal for "upgrade-ability" and will use 8mm bearings for "high-rate-of-fire-ability." Speaking of upgrades, while Echo1 has been doing a very nice job lately about using high-quality parts in their out-of-the-box models, if you were set on swapping out the stock Airsoft AEG motor that comes inside the Echo1 GAT, you'll want to make sure you purchase a "Short-Type" AEG motor. The mag release on the Echo1 GAT is similar to that of an H&K MP5, located right behind the mag and below the trigger guard. More news, Airsoft Squared, the epic Airsoft social network is now open to the Airsoft public, with hundreds of new members joining daily. They've really got a sweet setup over there, so check it out. Here is the full version of those teaser Airsoft Squared videos I've been sharing with you in recent blogs. But in this case, I happen to be an idiot posing as awkwardly as I could while brandishing two new Airsoft Prototypes: The Echo1 GAT AEG and the new SOCOM Gear Double Star 1911 Airsoft Gas Blowback Pistol. I can barely look at that photo. I'm sorry. I was cool in high school, though. Soooo anyway, Mr. or Mrs. Know-It-All-Already...Did you already know any of those facts?